Maybe masterpiece isn’t the right word…. but allowing your child to create their own taste combinations encourages new foods. Yesterday while preparing lunch, my preschool aged daughter told me she’d like to make a sandwich. She then put together romaine lettuce, black beans, hardboiled egg whites and balsamic vinaigrette on a whole wheat hamburger bun. I watched her assemble it and take one bite and then another, proudly looking up at me. She commented, “this is a really great sandwich.” I let her know I was happy she helped mommy prepare lunch. 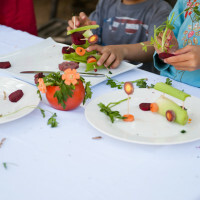 Allowing your kids to be creative in the kitchen when they’re young can help foster an interest in cooking that could stick with them throughout their life! Wouldn’t it be great to know that later they will be preparing a healthy snack or meal instead of grabbing for chips or overly processed ingredients?